An extended FOUR BEDROOM detached home with NO UPPER CHAIN. Situated at the head of this SOUGHT AFTER cul de sac within WALKING DISTANCE OF APSLEY STATION. Boasting two goodsized reception rooms a downstairs cloakroom, refitted KITCHEN/BREAKFAST ROOM, ensuite shower room and LUXURY FOUR PIECE BATHROOM. as well as fully enclosed gardens and a DOUBLE LENGTH GARAGE. Part glazed front door with outside light. Cloaks cupboard with overhead storage, wood effect flooring. A refitted white suite comprising low level WC, wash hand basin with mixer tap housed in vanity unit with cupboard below, tiled surrounds, radiator. With large double glazed window to the front, feature real flame gas fire, two covered radiators, TV point, wood effect flooring. With double glazed sliding patio doors to the rear garden, covered radiator, stairs to the first floor with feature chrome balustrade and hand rail, with inset step and skirting lighting, ceiling speakers, under stairs storage cupboard. With wall mounted cupboards, breakfast bar, covered radiator, double glazed door to the side, cupboard housing wall mounted Valliant gas boiler serving central heating and hot water, ceiling speakers. wood effect flooring. A recently refitted kitchen boasting a range of high gloss base and eye level storage units, display cabinets, work surface areas with inset one and a half bowl single drainer sink unit with mixer tap set below double glazed window to the rear, plumbing for washing machine and dish washer, built in double oven, four ring electric ceramic hob with extractor hood over, space for fridge freezer, double glazed door to the rear garden, wood effect flooring. Staircase with feature chrome hand rail rises to the first floor landing, colour changing opaque glass loft hatch to a fully insulated loft, ceiling spaeker. Double glazed window to the rear, covered radiator, dressing area with a range of fitted wardrobes with mirror fronted sliding doors, feature coved ceiling with inset mood lighting, TV point. 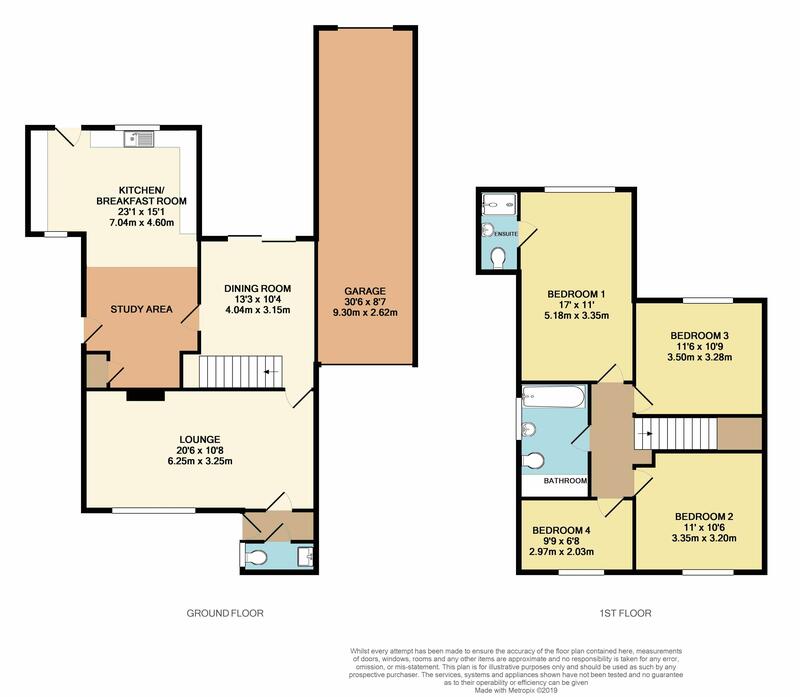 A luxury three piece suite comprising low level WC, wash hand basin, shower cubicle with glass screen, hand held shower and fixed shower head, tiled surrounds and floor, radiator, double glazed window to the rear. Double glazed window to the front, radiator, built in cupboard. A feature of the property is the luxury refitted bath/shower room, comprising low level WC, wash hand basin with mixer tap set in vanity unit with cupboard below, freestanding slipper bath with mixer tap and facing a built in TV...Walk in shower with feature Banksy wall tiles and rainfall shower head, tiled walls with fitted backlit glass shelves, ceiling speaker and feature infinity light, heated chrome towel rail, double glazed window to the rear. A double length garage situated alongside with metal up and over door, power and lighting, courtesy door to the rear garden. Driveway alongside providing off road parking. An open plan front garden, laid mainly to lawn with established inset and surrounding beds borders, gated access to bin storage area. A fully enclosed rear garden, screened by panel fencing and mature trees, paved area to the immediate rear with path leading to a full width decked area.